“Small seeds of gratitude will produce a harvest of hope.” It could be the Thanksgiving season or my recent reading of “Remember God” by Annie Downs, but when I ran across the quote above this week, it stuck with me. As we approach the holidays, it is not lost on me that this joyful season is a trying time for some. Some of our holidays don’t look like we thought they would. For others, their family might not look remotely similar to the famous Norman Rockwell depiction of Thanksgiving dinner. Yet, I love the reminder that even in the unmet expectations, the hard year or just the busyness the holidays bring, we can choose to cling to the moments of goodness throughout the year with thankfulness. 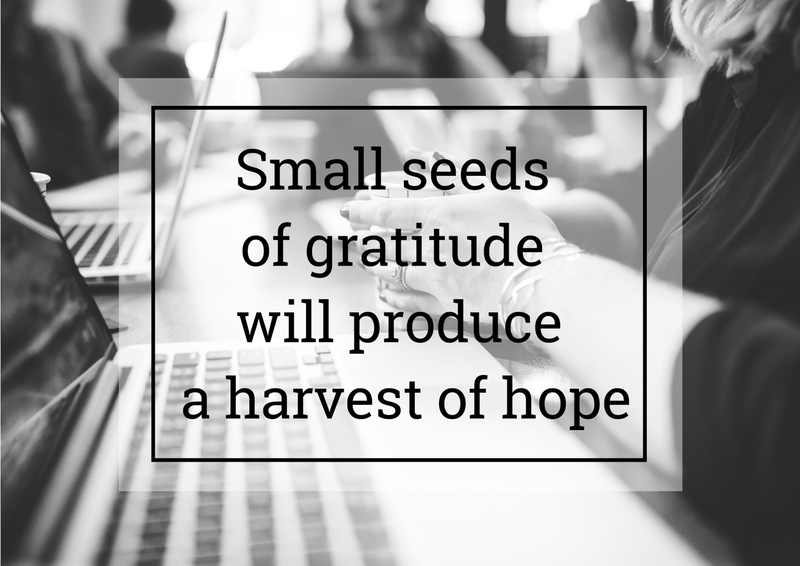 And, as we look toward 2019, those small seeds of gratitude allow our hearts to yield a harvest of hope for what is to come. A friend of mine recently asked her family what they were thankful for, to which she received the response, “Heat.” Ha! What a true statement in these 30 degree days we’ve been experiencing in Nashville! The funny thing about heat in our homes is that we can’t necessarily see it, but it’s around us, keeping us warm and providing for our needs. I’m certainly thankful for that! I love how Thanksgiving invites us to look around and notice the oftentimes overlooked elements of our lives that we are incredibly grateful for. This Thanksgiving, allow us to invite you in (would you care for hot tea or coffee? Pecan or pumpkin pie?) as we share our seeds of gratitude. I’ll never forget the day Matt turned to me and said, “Honey, I really believe that the reason we weren’t able to sell our house is because we were meant to find River Oaks. God knew that our family needed this community.” Little did we. Three years ago we found ourselves leaving a large, established church home of 13 years and joining a small church family who met in a high school theatre and had a heart the size of Texas. It’s here at The ROCC (River Oaks Community Church), where we’ve built a rock solid relationship with our lead pastor, John Shepherd. We’ve watched our oldest son, Dixon, be baptized and commit his life to Christ in a precious Christmas Eve service. And where we’ve learned the true meaning of a life group where friends really are family. Last night we hosted our life group Friendsgiving and as we went around the table sharing our most memorable Thanksgiving and what we were each most grateful for, I found myself choked up when it became my turn to share. 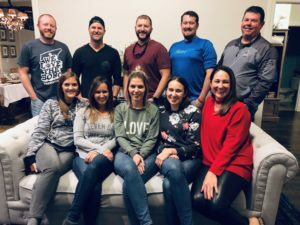 Our life group has weathered a great deal with our family – heartache and loss, parenting struggles and financial burdens. They’re the first to step in and serve our family and the last to leave when we need help. 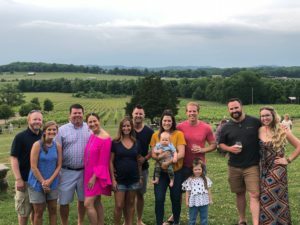 We’ve also celebrated the birth of four babies (Matt and I are clearly the oldest by A LOT), new jobs, expansion of businesses and new homes (both near and far). You name it and we’ve been through it together. Week after week we gather. Food, prayer, laughter, deep conversation, tears, kids screams – it’s all packed in there. So are the group texts between gatherings. So last night, as I looked around our kitchen and soaked in the value of authentic relationships, I was reminded of the power of gathering your people around a table and watching what God can do and for that, I’m incredibly thankful. When I think about what I am grateful for each day, my family always holds the top spot. I’ve been blessed with incredible, encouraging parents who are still madly in love after 30+ years. I’ve been blessed with hilarious siblings who I count among my greatest friends. And, when I got married, I was adopted into another warm, loud, rambunctious, devoted family just like my own. This year, our family grew by one really important member. 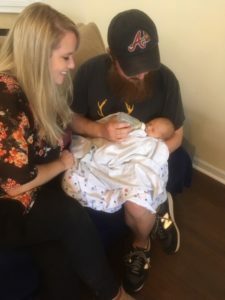 William came in to the care of Jake’s sister and brother-in-law, Jennifer and Mike, through the foster care system at just five days old. For more than a year, Jennifer and Mike and a whole army of friends and family members have cared for this sweet boy, all the while hoping and praying that he would someday be adopted into our family. Adoption, as many know, is a gut-wrenching, life-changing process, with many ups and downs, that takes patience, love and determination. As of last week, after more than a year in the foster care system, Will officially became a member of our family. I can’t tell you how proud I am of Jennifer and Mike who are some of the strongest people I know. They are incredible parents and have provided Jake and I with the beautiful gift of a nephew. Thanksgiving will always be my favorite time of year, but this Thanksgiving will likely always be one of the most special. Some of my favorite childhood memories are of waking up on Thanksgiving Day and watching (and attending) the Macy’s Day parade, making cinnamon rolls and looking through the Black Friday ads. All of those memories come flooding back every November. As I get older, I’ve started taking time during November to think about the big and small things I’m grateful for in my life. This year has been full of blessings that I could list for days, but I wanted to take this time to highlight one of the smaller things I’m grateful for this year, my new-to-me 2012 Ford Escape. 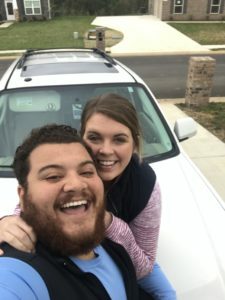 My husband and I have always agreed on our financial goals, and during our honeymoon, we made a goal to be debt free by our third anniversary. After returning from glorious Jamaica, we started working towards our big goal. We quickly realized if we wanted to be debt free by year three we’d have to do something big. So that’s what we did, we traded in our cars and became a single car family. At first, I thought our new wheels would be tough to handle, but I quickly realized it has been one of the best changes we could have made. With the sale of our cars, we were able to pay off a large amount of debt, but what I’m most thankful for is the time this car has given us. We started carpooling everywhere. After a long day at the office, we spend the ride home talking it through. I gained 30 extra minutes with my husband to-and-from the airport during a hectic travel season. We communicate regularly about our daily plans to make car arrangements. It’s forced us to step out of our comfort zone and asked friends/co-workers for rides. We’ve listened to several new podcasts which we continue to discuss long after our drive is over. I’ve even noticed we’ve started running errands, we used to run alone, together because we love our time together in our Ford Escape! I know this season will pass and one day we’ll get a second car. 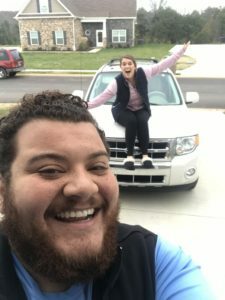 It will make daily tasks more manageable, but I will forever be grateful for the time and lessons our Ford Escape taught us early in our marriage. This year has been full of trials, changes and new beginnings. From having surgery after breaking my wrist, graduating from college, moving, starting a new job and getting engaged this year has been nothing short of exciting. However, with the excitement of transition, it is also joined by lots of worries of the unknown. When I think about this year and what I have been most thankful for, it would have to be my family. 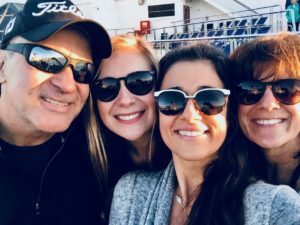 All of my favorite moments involve them and I am so blessed to have such a loving, fun, caring and hilarious dad, mom and sister. From the beginning of the year, they have taken on every change with me and helped me tackle it and exceeded all of my expectations. In January when I had surgery, our family was on the way to Mexico three days later. They may have had to wash my hair, help me cut my food and sacrifice a lot of fun activities, but they still made it worthwhile. 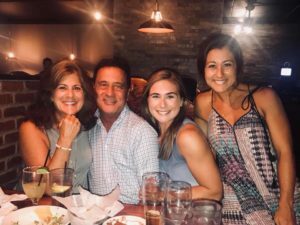 After graduating from Samford University in Birmingham this May, I had the privilege of getting to move back to Nashville and to be near my family once again. Through this crazy of transition of 2019 I could not be more thankful for them. From the trips, game nights, movie nights and pool days, they always keep me laughing and make my heart full! This Thanksgiving, I am so grateful for this family of mine and I can’t wait to love on them this holiday season. As I look back on 2018, I have to say I am most thankful for special moments with my boys and the people we love. This year, we instituted “Murphystoky Mondays,” a play on our last name and that of the family we have weekly dinners with. With two precious girls two and under, the Bastokys are in a similar life stage. As I think back on the weeks we shared dinner in our homes or at our favorite chicken joint, Toot’s, I’m struck by what it means to do life closely with others. Some weeks, we had big wins at work, our kids hit huge milestones and we celebrated the goodness of life. 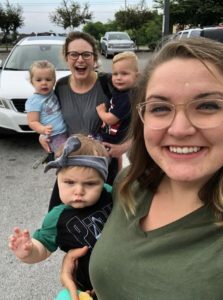 Yet, as we gathered around in other weeks, we had experienced losses in our families, challenging times at work, or our two year olds were being incredibly and positively “two.” Just this past week, my husband and son arrived to dinner thirty minutes late due to traffic on the way home from daycare. When they arrived, James refused to eat any food our friend had prepared. Then, forty minutes after arriving, it was time to leave for bathtime (cue the tears and screaming). I texted my friend a long apology upon leaving, to which she replied, “We never expect you to be any type of way. We choose to spend the crazy time around dinner with y’all weekly because we love you despite what life flings our way.” This Thanksgiving, I am so incredibly grateful for the Bastokys, who love big and give grace even more. Each and every day I am thankful for the life I get the opportunity to live. This past year has been quite an adventure, from shoulder surgery to moving to Nashville and gaining a place on the Choice team…sometimes I feel like I need to pinch myself for getting to enjoy my health, explore a new city and work in such a wonderful environment with an amazing team. 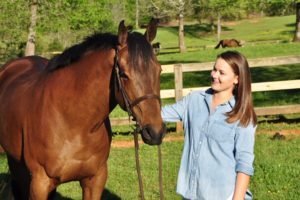 One of the many blessings in my life, is the opportunity to continue my hobby of horseback riding and not only continue the hobby in general but enjoy it with my own horse, Eli. It is truly a blessing that my parents have been so supportive of this journey and encourage me to continue my passion. In the past three years that Eli and I have spent together, we have lived in three different states and I am optimistic we have made it to our final home here in Tennessee! I beyond grateful for the farm he lives at here in Nashville that provides amazing care and offers a facility he gets to enjoy. There is no better stress relief than spending time at the barn with him and riding. This time last year, Eli suffered a break to a bone in his foot and we were given a grim prognosis from the veterinarians that he probably would not make a full recovery and I shouldn’t expect to be able to ride, let alone jump him ever again. Now a year later, I am happy to say (and honestly quite shocked) that he has made a full recovery and has no limitations. Among the many things to be thankful for this Thanksgiving, Eli definitely holds a top place in my rankings and I look forward to spending the holiday with him and my family.